THE civic flag has been flying at half-mast on Woking Borough Council’s offices, in tribute to a former mayor who died last week. Richard Williams, who was well-known as a dedicated Labour councillor for many years, passed away last week, aged 89. He was mayor in 1991-92, during which time he officially opened The Peacocks shopping centre, declaring that it had transformed Woking from a one-horse town into an important regional centre. Mr Williams was elected to represent Kingfield and Westfield Ward in 1979 and served as a Labour member until 1996. 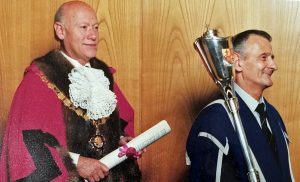 The council’s mace bearer at the time, Ron Simms, remembers him as “a nice chap, a working man’s mayor”.